Black hole sun: is there life beyond the event horizon? A little closer to home (and also via Next Big Future), there’s a new start-up kicking around in Silicon Valley. Which isn’t news in itself, of course, but rather than designing the latest portable device or niche-focussed social network, MoonEx has scored a NASA contract that could be worth US$10m with a business model based on building autonomous robotic rovers designed to mine the Moon’s regolith for the increasingly rare metallic elements that our electronic systems depend upon. No doubt they’ll be keeping a close eye on SpaceX’s Falcon Heavy. Just look at it. 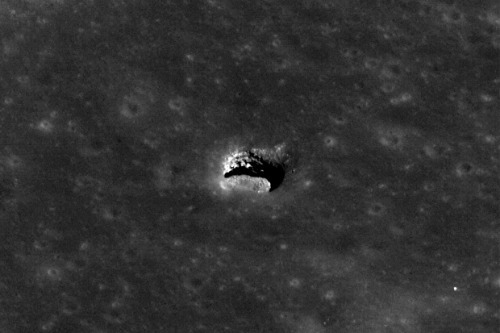 Posted simply for the fact that it’s a cool thing to think about, and because we seem to be on something of a space riff in recent weeks, here is a picture of a bloody great cave entrance on the Moon. Next Big Future has screengrabs from (and links to) two reports from the University of Texas looking at the practicality of human exploration beyond Low Earth Orbit before the end of the decade. Lagrange Point habitat, anyone? Once Space Fence has spotted a chunk or orbital crud, what then? The Japanese Space Agency proposes using a pre-space technology for scooping them up out of harm’s way: a kilometers-wide fishing net. SpaceX Dragon capsule: breaking a trail to a new economic frontier? You’d have had to be living under that oft-mentioned internet-proof rock (or possibly just focussing on that other currently ubiquitous news topic) to not have noticed that yesterday’s launch and re-entry of SpaceX’s Dragon capsule went off exactly according to plan. So when – if? – the Wikiwars die down a bit, expect a lot of pondering from all sides about the future of commercial space exploration, unfettered (well, kind of… or rather not really) by the capricious politics and budgeting of nation-states. Hell knows I’ll be waffling about it a fair bit… but then you probably knew that already. Lunar prospecting, then, is a first step in determining the existence of asteroidal metal containing nickel, cobalt and platinum-group metals on the surface. We have much to learn, including not just the quality and location of ores, but also the location of volatiles like water. We also need to learn what happens when asteroidal nickel/iron is made into metal products, and to what extent we will have to rely on engineered alloys to get the desired result. At present, of course, we cannot test the processes we might use on the lunar surface, requiring a preliminary manned base there to work through these contingencies. Andrews works out a simple cost model exploring mining, processing and shipping operations, comparing these to existing costs. With platinum, for example, selling at close to $40,000 per kilogram, a price that is itself escalating, the case for lunar mining is clearer than that for more plentiful products like cobalt. How will the mining be accomplished? That’s left for someone else to write a paper about… but how we might get there and back again gets a look-in. Andrews proposes a lunar sling for launching metal products to Earth, but goes into greater detail on what any space infrastructure requires going out of the gate: A simple and inexpensive way to get to Earth orbit, what he calls FRETOS — Fully Reusable Earth-to-Orbit Systems. A fleet of five launchers supporting a flight rate of 1000 launches per year using four tethers is at the heart of the proposal. On the space side, a Skyhook capture device located at 300 kilometers orbital altitude is part of a picture that also includes a Low Earth Orbit station at 1000 kilometers, a powered winch module at 1700 kilometers and a counter-balance at 2400 kilometers. The total mass of the space segment is estimated at 190 metric tons, including 2100 kilometers of tether lines, high-speed winches, power generation arrays, counter balances and station-keeping components, all to be launched separately and docked together for assembly. Comments Off on SpaceX Dragon capsule: breaking a trail to a new economic frontier? “It’s really wet,” said Anthony Colaprete, co-author of one of the Science papers and a space scientist at NASA Ames Research Center at Moffett Field, Calif. He and his colleagues estimate that 5.6% of the total mass of the targeted lunar crater’s soil consists of water ice. In other words, 2,200 pounds of moon dirt would yield a dozen gallons of water. The presence of water doesn’t make it more likely that there ever was life on the moon, as the location studied is among the coldest in the solar system. But the large quantity boosts the case for a manned lunar base from which to launch other interplanetary adventures. Water is crucial because its components, hydrogen and oxygen, are key ingredients for rocket fuel. Oxygen can also be extracted from water to make breathable air. … or alternatively, the world’s super-rich can decamp to the water-rich Moon while the rest of us fight over the limited amount of it available to us down at this end of the gravity well. There’s at least one novel in that idea, I reckon.